Every firefighter has a story. Here’s your chance to share your story about how you got started, how you got to where you are today and what keeps you going every day. Maybe you’re not even a firefighter but you share an admiration for one. We’d like to hear that too. Who knows? Maybe your story will be included in “Run to the Curb” — the book or you’ll end up as a guest on my Firefighter Storytellers Internet radio show. This is your chance to run to curb and tell your story. What a great site! I have looked for a link to tell my story but I think I am missing it. Is this the way or is there something else that I can’t see. I received your e-mail earlier in the week but have been away from my computer for a few days. I hope to get your story posted this weekend but would love to have some photos to go with it. You want to hear an incredible story of brotherhood? 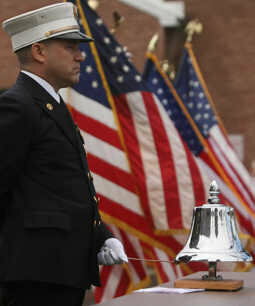 Check out my post on the Oak Park firefighter and what he did for his brothers who had been laid off. Did I say incredible? That is a great story. Not everyone has to lay down their life for their fellow firefighters just to demonstrate their brotherhood. Laying down your full and rewarding career for others is one of the most generous acts of brotherhood I’ve ever been witness to. Most importantly, thank you Rick Wilkie and the others just like you. I grew up in a small town that summoned the volunteer fire department with the town’s civil defense siren. My father managed the lumber yard that was directly across the street from the fire station. Often times I would hang out at the lumber yard and when the whistle would blow I would run to the front of the office and watch the men run into the station and get on the trucks to head out to the fire. As time progressed and I grew older I learned the town also used the telephone to alert the fire department there was a fire and where it was. One of the town’s two undertakers lived down the street from me and he had an exterior speaker on his phone to alert him to a phone call while he was outside the facility. This phone became my early warning system that there was a fire call taking place. When I heard the long ring of the fire phone, as opposed to the normal broken ring of a regular telephone call, I would jump on my bike and head to the fire station, often times beating any of the firefighters to the station. Prior to the days of 911 callers had to dial a four digit phone number for a local call. A local doctor’s office had a number just one digit different from the fire number and on a few occasions someone calling the doctor’s office would get the wrong number; the fire phone would buzz its long tone and I would scramble to the fire station in vain. I remember one particular incident, I was probably a freshmen in high school, when the fire phone rang while we were at the table eating our evening meal. I put my fork down and as soon as the fire whistle sounded I pushed back my chair and headed out the door. My father started to object but my mother, bless her soul, gave him the look and said, “let him go, he ain’t hurtin’ nothing”. There was another time when I and a good friend of mine, who also had the bug, were setting in the movie theatre just a block away from the fire station when the whistle sounded. We looked at each other, quickly decided a fire was more exciting, and headed out the door to the fire station. We ran at least six blocks chasing the last truck out of the station to a house fire. It wasn’t long before my parents showed up on the scene, seemingly sure that they would find me there too. As the years went by I came to know many of the members of the department and felt comfortable wandering into the station when they were there washing trucks or doing some other task. I have never been a member of this department but it is to them that I owe my career as a volunteer. Upon moving to a community similar to the one I grew up in I quickly discovered the meeting times of the local volunteers and more than once I found myself driving around the block to ogle the equipment. I wasn’t brave enough to walk in the door unannounced and ask about membership requirements. My business put me in touch with the public and I soon discovered a client or two that had ties to the fire department and a few short months later I was approached by the chief of the department about whether I had an interest in joining the department. My entry had already been approved by the membership; all I had to do was say yes. I still remember hearing the pager tones come across the scanner, with my mom’s voice dispatching the fire department to a call. Our neighbor down the road was a fireman. I recall running to the window and see his pick-up race down the road to the “barn.” I was 8 years old when I joined as a junior firefighter with the county department. I will always remember having the meeting nights at my bus drivers house, as the only engine was housed in his barn the first years of the department life. And it’s a great one for Mother’s Day. I’d like to hear more and maybe see some photos to go with a featured story here. I guess that you can say that I was always interested in the volunteer fire service. A good friend of the family, along with his two sons were members of a department and my brother-in-law was also a member of another department. I never really gave it too much thought until I was hanging out with a few people that I had recently met and started hearing the stories that they told of the ‘big one’ that they had responded to. By chance, in 1992, the friend of the family asked me if I was interested in joining the local department. I said “sure” and that was the beginning of my service. Fast forward 18 years later: I am still an active member of the same department that I joined. I have worked my way up through the ranks of Lt. and Captain, Asst. Chief. I am currently Chief, which I have held for the last few years. I can remember the first call that I ever made. I happened to be near the fire hall when the roof top siren went off. I did not have a pager at the time and we relied on a Plectron for notification. I was the first one at the hall and then one of the senior members got to the hall. He asked me if I had been cleared to drive and I said yes. At that point he told me to drive and we jumped into the pumper. What a rush it was to be on my first call, driving to a working car fire with the red lights and the Q-siren wailing away. Even today I still get that same rush. I think that knowing that I am ready and able to help my neighbors, complete strangers, when they are in a dire need is what satifies me and keeps me going every day. I was just having a conversation with some firefighters Saturday night about the influence of “chance” meetings and occurrences. Although, I think it’s more than just “by chance” that you’re a firefighter today. Keep up the great work. I’d like to feature your story if you’d like to e-mail any additional info to me along with photos. I didn’t have enough to make the connection. Besides, my memory is receding with my hairline so you see how much trouble I’m in. Great stories Saturday. Please send me an e-mail to tiger@tigerschmittendorf.com with all your contact info. Where to start? There are so many reasons why I started in the service and all of the reasons are why I’m still here today. I remember as a little kid my father getting up in the middle of the night and leaving. I asked my mother where did he go last night, she said a fire, I guess I didn’t realize that my dad was a firefighter. The next day I remember going past the chared remains of what was a old farm house down the street from our house. As most boys I thought it would be cool to be a firefighter and I’m sure I played firefighter at my house as a kid. I later found out my Grandfather fought mountan fires with my Great Uncle who was the fire warden, and I alo found out that another Great Uncle was a Assistant Chief for a railroad. Then one day when I was around 5 or 6, I was playing with a friend and he was fatally hit by a speeding motorist, I obviously was devastated. I remember there was a firefighter that lived accross the street from the house and he was there in no time flat. My uncle who was an EMT also showed up with the ambulance. They stayed with my family all night until I went to bed. I guess I didn’t realize it at that time, but this was the turning point. Later in life I felt that I needed to do something to help the community and little kids as the firefighters and EMTs did for me and my friend that day. I became a volunteer firefighter at age 16 in Pennsylvania. I went to college and got an associate degree in emergency services technology and wanted to make a career out of it. I thought long and hard then I decided to stay a volunteer and at some point try to help more volunteers. I have now been on the job for 18 years and have held various positions along the way. I am currently a captain and training officer for a combination department in PA. I continously strive to make my firefighters the best they can be. I always tell them that I’m training them to take my job. I’ll stay on the job as long as I can. My wife is very understanding of this passion I have. I have two children now and they are on my mind every second I run out the door for a call. I still do the job because I want to help my community, go ahead roll your eyes but it’s true. What happened to me when I was six I will never get back, but if I do my job well maybe I can repay what I owe in some small way. Some people turn away from tragedy and you chose to turn towards it. That makes you a very special person. Thanks Tiger, you asked me to tell my story the other night on firefigher netcast. I’m glad I could share my story. I just wish we (my station) could get some volunteers that share the pasion. You may be hearing from me on some of those issues as my depart works through a marketing plan.